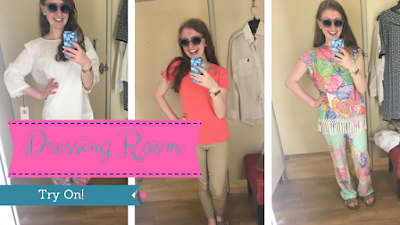 Life as Pink Einstein | Dallas Fashion and Lifestyle Blogger: TJ Maxx Dressing Room Try On! TJ Maxx Dressing Room Try On! I did some more shopping but honestly are you surprised? My Step mom (MB) and I went to TJ Maxx in search of some Lilly Pulitzer at a good price and I hit the jackpot! And I took pictures in the dressing room to do another try on! For my outfit going to the store I wore this bicycle tank and khaki pixie pants from Old Navy and my Birkenstocks. So I found this Lilly Jasmine Caftan top and a pair of Georgia May Palazzo pants in Roar of the Seas print. We thought I could try it on together and see if it would look good as a set and it did not. I love this top! It is a very thin material, great for summer and the sleeves are kind of like cap sleeves (they're hard to explain) and I love the tasseled bottom. This Lilly top was $39.99, regularly $158.00. I love the pants too but the only problem I had was that they are very long. I think they are meant to be worn with very high heels but with the condition my feet are in that is not happening so I am going to hem them up. The Lilly pants were $39.99, regularly $138.00. So lets start with the top. I love this top, it has eyelet cut outs which are kind of hard to see in the picture and the top is slightly see through and the trim around the sleeves is amazing. This top is by Ivanka Trump and was $29.99, regularly $79.00. The TJ Maxx I went to had a ton of these Lilly pants so I tried on my two favorites. These were an XXS and they fit a whole lot better than the small pair but I think I will have an easier time getting away with the small pair at school. These Lilly pants were $39.00, regularly $138.00. I loved this dress on the hanger because it looked like something a princess would wear. I tried it on and I looked more like I was wearing a sack than I did a princess. The dress is a gorgeous blush pink and it has eyelet cut outs. I was trying not to laugh in this picture. I liked this dress on the hanger too but I could not see myself wearing it. I looked like an old lady. The dress had a circular design printed on it and had navy trim. Along with Lilly, I was looking for a white top to go with a new Vineyard Vines skirt I recently got and one that would also go with these pants. I didn't like this one because it was restricting my arm movement and I didn't like that it was totally see through. I loved this off the shoulder top but for some reason I didn't buy it. This was the first off the shoulder top I've ever tried on and I definitely like them on. I think I will be purchasing one in the future. The top was a simple white and was frayed on the sleeves and the bottom of the shirt. I tried this one on just for MB, it wasn't really my style but it was still cute. Its hard to tell in the picture but it had a high low hem going down the sides. The front is crocheted with red and pink flowers and the back is also crocheted. Of course I love this top, its covered in lighthouses, anchors, and other nautical things. The shirt is a cream almost khaki color and has nautical items printed in black on it. This shirt is by the brand W5 and was $12.99, regularly $18.00. I was so happy when I found this shirt! TJ Maxx is the best place to find Ralph Lauren tee shirts and I love the color of this one! The shirt is a bright coral with a blue polo and it has a v neck. I would definitely recommend going a size up in these shirts because they tend to shrink. The Ralph Lauren tee was $16.99, regularly $39.50. I tried another Ralph Lauren shirt on and I loved the color and stripes but I didn't like the cut of it. This was $16.99, regularly $39.50. I live in navy stripes and even though I already own a navy striped Ralph Lauren shirt I had to buy another. This one has thicker navy stripes and a v neck. This was $16.99, regularly $39.50. Yep, another Ralph Lauren tee. I could live in these! I tried this on to see if it would go with my skirt but I don't think it will so I didn't get it. Even though I really loved it I could see it having ketchup stains after one wear so I put it back. This was $16.99, regularly $39.50. That is all for this Dressing Room Try On if you enjoyed reading this one you can click here and here to read others! Such cute clothes! I absolutely love the off the shoulder top and the shirt MB picked out! Thanks! I loved the off the shoulder top too and I'm thinking about going back to get it.